* Pre-Algebra: This course teaches the fundamentals of math, which many students tend to miss out during their regular school years. * Algebra I, II: 6-8th graders. This course helps the students learn algebra with joy, improving their precise knowledge in it. * Geometry: This course helps the students learn geometry more easily and have a fun in it. * Trigonometry: This course helps the students clearly understand trigonometry from the beginning to the highest levels. * Pre-calculus: This course helps the students figure out the key concepts in calculus, which is widely used in science, economics, and engineering, enabling the students to be in preparation for studying the AP courses to come. * AP Calculus: * AP Statistics: This course helps the students be prepared for the college courses Calculus / Statistics courses. * ACT / SAT : * SAT II Math: 9-12th graders. This course offers preparatory study for entering college and also makes the students success in tests. 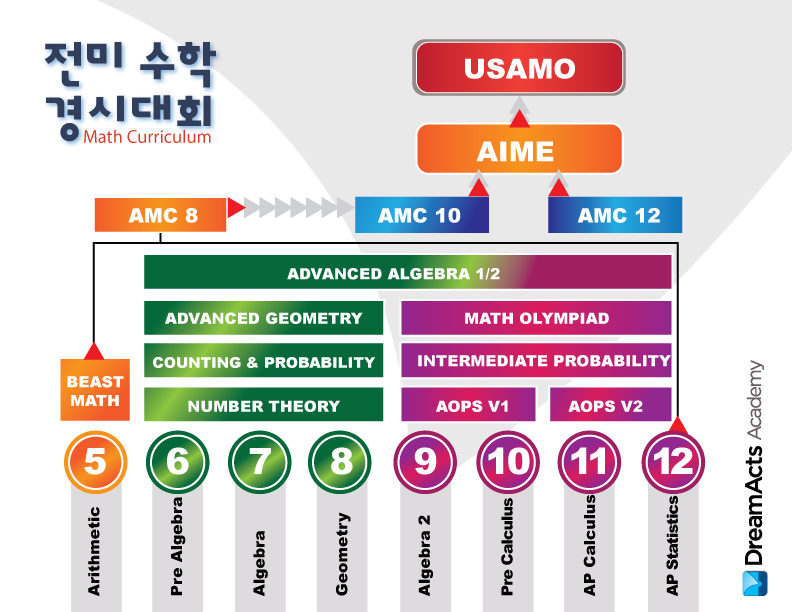 It also shows a clear overall outline of math taught at high schools so that every student could grasp at a glance what they have learned.